The royal of roasties, grown in Devon by our neighbours Neil and Gary Farley. 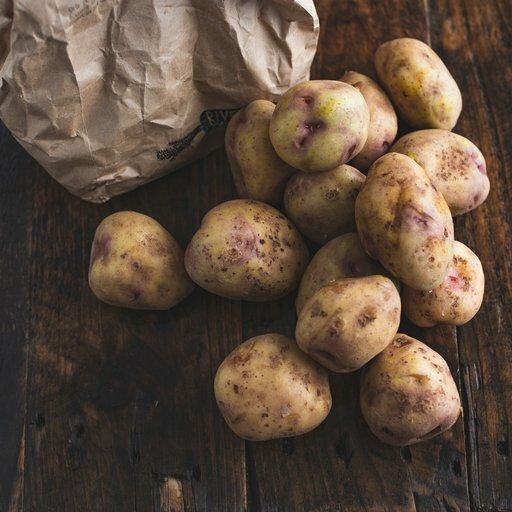 King Edwards are the ultimate roasting potatoes, with fluffy middles and crunchy golden skins. Serve with a scrunch of sea salt and black pepper. Just make enough for seconds! For fantastically crunchy roast potatoes, preheat the oven to 200°C/Gas 6. Put halved potatoes in a large pan of salted water. Bring to the boil and cook until tender (about 12-15 mins from when the water starts to boil). Drain the potatoes in a colander, let them steam dry, and give them a shake to roughen their surfaces. Heat a little oil or goose fat in a roasting tin in the oven. When the oil is hot, add the potatoes, turn them gently in the oil to coat, then season and roast until golden and crisp. Grown in Devon, by our neighbours Neil and Gary Farley. Their farm has just the right soil for the job: fine and sandy, so that it is still diggable in winter. Rather than hurrying the potatoes out of the ground before it hardens up, they can leave them to grow until the last possible moment, getting more flavoursome all the while.